MOTHERHOOD IS... FLUSHING TOILETS WITH STAGNANT PEE IN THEM - ProudMummy.com the Web's Community for Mums. 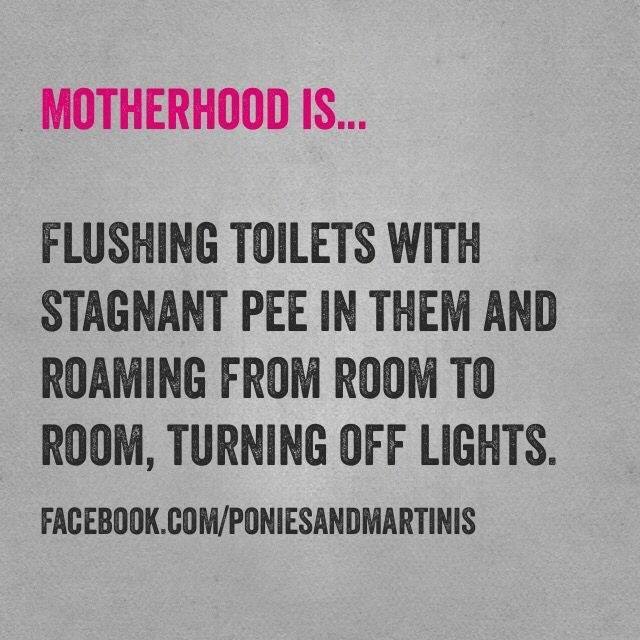 MOTHERHOOD IS... FLUSHING TOILETS WITH STAGNANT PEE IN THEM AND ROAMING FROM ROOM TO ROOM, TURNING OFF LIGHTS. Could add being a wife to that too! That's my bedroom routine. But i live alone! So do I. And the grandchildren haven’t even been! Georgia Kyle, Libby Kyle they seem to have missed out tracking down missing dishes/ cutlery! It's not just me then doing this constantly! My life summed up in a status! Omg. This is my life! Debby Corstorphine .... motherhood ? !